The concept of Advanced Crew Transportation System, ACTS, also known as "Euro-Soyuz," Crew Space Transportation System, CSTS, or PPTS in Russian (from Перспективная Пилотируемая Транспортная Система, ППТС) emerged during 2006, when Russian company RKK Energia realized that its proposals to replace the workhorse Soyuz spacecraft with the Kliper reusable glider would be too ambitious for the current level of funding of the Russian space program. As of 2006, Russian Space Agency expected to get nine billion rubles until 2012 for the development of the next generation manned transport, of which, only 500 million would be allocated for the task before 2010. 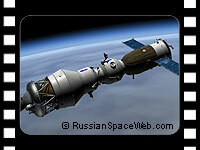 As a result, the agency decided to focus on the development of a modified Soyuz, capable of reaching lunar orbit. Potentially, such spacecraft could serve as a bridge paving the way to the Kliper. 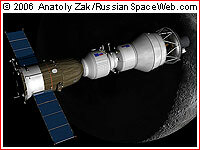 The circa 2006 Russian concept of a modified Soyuz to reach lunar orbit. 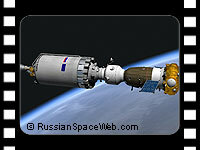 In December 2005, European governments rejected Russian proposals to join the development of the Kliper spacecraft and, by June 2006, the Russian government itself refused to choose a prime developer of the next generation spacecraft or even possible configuration of such a spacecraft. As a result, the new concept for the Russian-European cooperation in manned space program had been conceived around spring of 2006. This time, two sides considered combining funds, hardware and expertise to parallel the US effort to return astronauts to the Moon. The idea was apparently based on previous studies, which considered upgrading the European ATV cargo ship with a Russian-built reentry vehicle, which would enable it to return cargo or even people to Earth. RKK Energia's proposals to upgrade the Soyuz to make it capable of flying around the Moon received favorable reaction in both Moscow and European capitals. On June 21 and 22, 2006, ESA’s ruling council, meeting at the agency’s headquarters in Paris, France, made a decision to embark on a two-year study in cooperation with Russia on possible development of a spacecraft capable of reaching lunar orbit. At the time, the program was designated Advanced Crew Transportation System, ACTS. According to Russian sources, Soyuz upgrades could include a brand new habitation module developed by European Space Agency, ESA. In September 2006, Russian, French and German leaders held a summit in France, which dealt among other things with Russia's controversial bid to purchase a stake in European aerospace giant EADS. Space cooperation apparently came up as well, as Russian President Vladimir Putin emerged from the meeting with the Europeans, with assurances that France and Germany were interested in cooperative work with Russia on the next generation spacecraft. However, it was not clear from Putin's statements whether he was talking about the ACTS concept or the Kliper reusable vehicle. 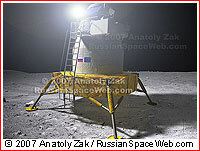 In October 2006, Nikolai Sevastyanov, the head of RKK Energia, told the RIA Novosti news agency that his company initiated a final phase in the preliminary design of the upgraded Soyuz spacecraft, which would be capable of lunar missions. According to Sevastyanov the new vehicle would be equipped with the digital control system and could be launched either from Baikonur or the European Space Agency's site in Kourou, French Guiana. 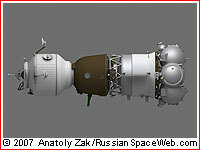 Sevastyanov identified the spacecraft as Soyuz-K, which apparently was a development name of the spacecraft, which could benefit the ACTS program. 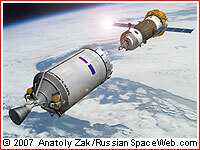 "K" stood for Kliper, which could also benefit from new systems developed within the Soyuz-K program. On October 26, 2006, the head of Roskosmos Anatoly Perminov echoed Sevastyanov saying that the radical upgrade of the Soyuz spacecraft would be ready by 2012-2013. 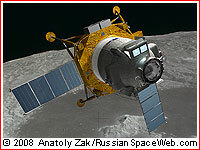 During 2006, RKK Energia, the developer of the Soyuz, outlined several mission scenarios, which would enable the veteran Soyuz spacecraft with relatively modest modifications and combined with other "off-the-shelf" hardware to loop around the Moon, then to enter lunar orbit and, ultimately, to land on its surface. However with reliance on existing fleet of medium-lift rockets, these missions would require two, four and seven launches, respectively! The least complex mission into vicinity of the Moon would include the launch of the Soyuz spacecraft with a crew of three by the Soyuz-2 rocket into the low-Earth orbit, where it would link up with the Block DM upper stage, launched separately onboard the Proton rocket. The Block DM would then fire its engine, boosting the Soyuz beyond the low-Earth orbit into a long loop, which would swing behind the Moon. The Block DM stage would carry its own habitation module, which would provide extra comfort for the crew on a week-long trek over the dark side of the Moon. The crew could include one or even two tourists, each paying as much as $100 million for the ticket, according to the estimates made by Western companies marketing such missions outside Russia. In order to deliver Soyuz into orbit around the Moon, four rockets would be required. Two Protons would place a pair of Block DM orbital tugs and two Soyuz rockets would launch one manned spacecraft and one Fregat orbital tugs. All four vehicles would have to dock in the Earth orbit, from which one Block DM's would be used to send the Soyuz toward the Moon and another to insert the spacecraft into lunar orbit. The Fregat stage would then send the spacecraft from lunar orbit toward Earth. The task of lunar landing with the use of same rockets, would require adding three more Protons into the list. They would launch a lunar landing module and two orbital tugs needed to send the craft toward the Moon and then to insert into the lunar orbit. The manned Soyuz would then link up with the lander in the lunar orbit and two out of three crew members would land on the surface. Seven launches and seven dockings required to accomplish the lunar expedition would make this scenario extremely complex and unreliable. Realizing impracticality of using medium-size rockets for mounting lunar expeditions, RKK Energia upgraded its lunar exploration plans by the beginning of 2007. As first presented in the Itogi magazine in February 2007, the new concept relied on the yet-to-be-developed Angara launch vehicle. Three Angara rockets would be needed to launch a lunar lander and two high-performance space tugs powered by cryogenically cooled liquid hydrogen and liquid oxygen. These two space tugs would be used to boost the lunar lander and the Soyuz with the crew toward the Moon. 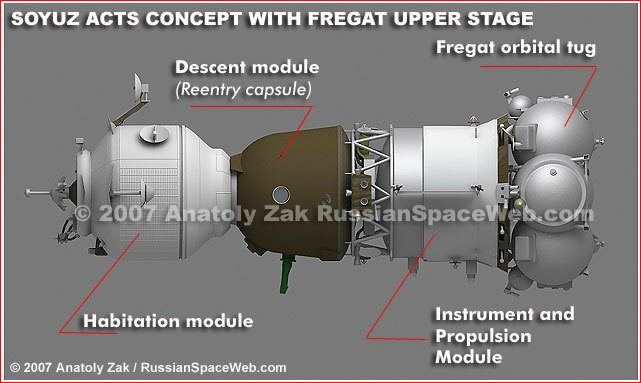 The Soyuz itself would be upgraded with the off-the-shelf Fregat upper stage and launched by a single Soyuz-3-type rocket. Thus, the lunar expedition could be accomplished with the total of four launches, two dockings in the Earth orbit and two in the lunar orbit. The lunar orbiting missions could be accomplished with only two launches. Obviously, the introduction of even more powerful versions of the Angara rocket would allow to fit the lunar expedition into two rockets, similarly to NASA's SEI program: one rocket, carrying the lander and the space tug and another a manned transport vehicle. After almost a year of combined efforts, Russia and Europe enter the final stage in determining a look of a new-generation spacecraft, which would carry astronauts to the Moon. 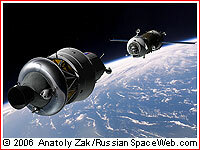 In May or June of 2007, Russian and European space officials were expected to choose what they identified as an "initial preferred concept" for a future manned spacecraft. It is the first major milestone in the implementation of the Advanced Crew Transportation System, or ACTS. The Soyuz spacecraft in the low-Earth orbit is preparing to link up with the Block DM upper stage, which would then boost the tandem on its way toward the Moon.